I’m not that much of a space geek, though I do enjoy a good sci-fi story if the characters draw me in. But my niece Megan posted a picture of a planetary nebula that some call “God’s Eye” and it prompted some Googling to find out more about it. The pictures and the description of how these phenomenon are formed fills me with a sense of wonder. There are things in our world and out of it that remain mystical mysteries to me. I know they are “real” but they feel more like magic. How can we limit our understanding of what’s possible if such things actually exist? 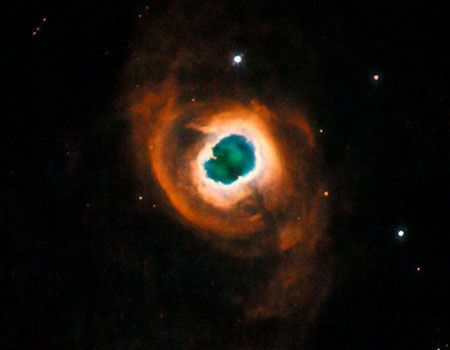 Planetary nebulas have nothing to do with planets. They were named so because in early telescopes, they had the fuzzy look of planets in our outer solar system. In fact planetary nebulas sit throughout our galaxy. This one contains the outer layers of a red giant star that were expelled into space as the star entered its death throes. Ultraviolet radiation from the remaining hot core of the star zaps the ejected gas shells, making them glow. A bright inner ring is surrounded by a bipolar structure.